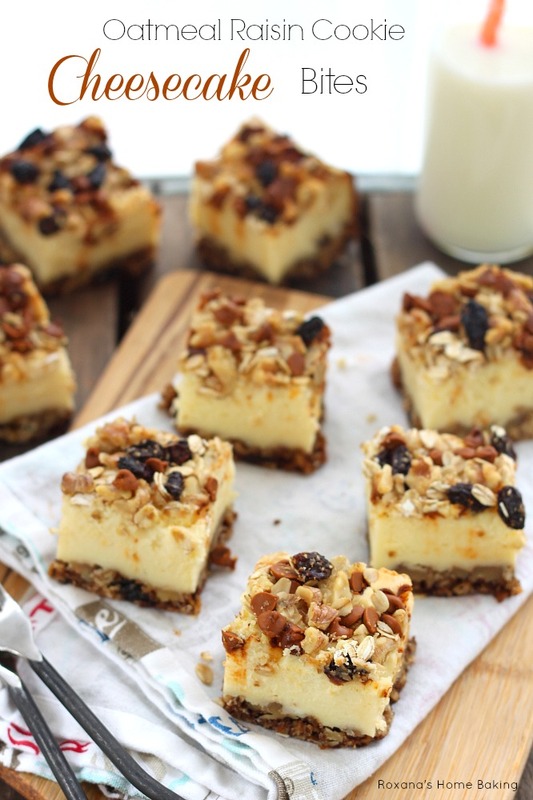 Oatmeal raisin cookie cheesecake bites – oatmeal raisin cookie dough pressed evenly on the bottom of the pan as a crust for the creamy, rich cheesecake and crumbled topping. Today I have some great news to share with you. I’ve told you before I’m a bad organizer, so please don’t judge me for taking me a week and a half to tell you. Do you remember those cheese raisin crackers I’ve made for the Culinary Challenge as part of the Eat Write Retreat conference? You do? Well guess what? I won!!! Yes, I’m still doing a happy dance! It’s my first time ever winning such a fun baking contest! (Excuse me 5 more minutes while I jump with joy!). Thank you California Raisins! Now, of course I could not have told you I won without a recipe using raisins. This time it’s not an appetizer. I picked something I’m pretty darn good at and you guys most probably know by know cheesecake is my favorite dessert. The recipe of these cheesecake bites I adapted it from Pillsbury Bake-Off® Contest but since I did not have any refrigerated cookie dough I’ve decided to give it a couple of twists, make oatmeal cookie dough from scratch. The oatmeal cookie dough base is soft and chewy from the combination of brown and white sugar and chopped raisins but at the same time the oats and walnuts help with the crunchy texture. 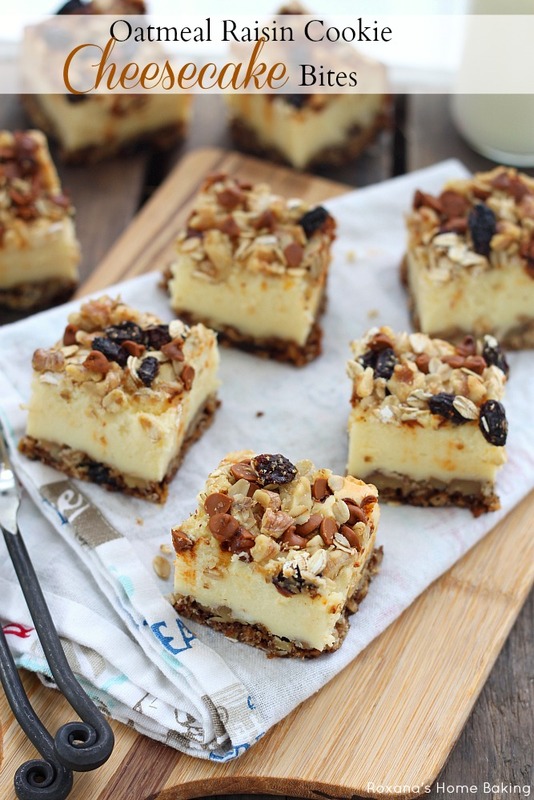 The cheesecake is sweet, rich and creamy but since it has a little bit of flour added to it is not as velvety as other cheesecakes which makes it perfect to be topped with a mixture of oats, cinnamon chips, walnuts and more raisins. Overall, these oatmeal raisin cookie cheesecake bites are a mouthful. 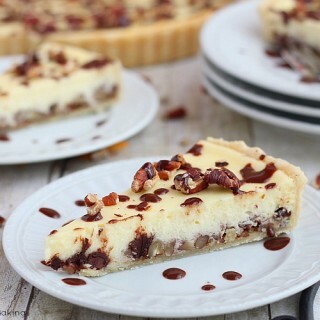 In one bite creamy cheesecake combines with crunchy walnuts, chewy raisins and flavorful cinnamon chips. Oatmeal raisin cookie dough pressed evenly on the bottom of the pan as a crust for the creamy, rich cheesecake and crumbled topping. Heat the oven to 350F. Line an 8X8" baking pan with parchment paper. Set aside. In a mixing bowl, add the butter and sugars and cream until light and fluffy, for about 2 minutes. Add the egg yolk and vanilla extract and mix well. Fold in the flour, baking soda, salt and oats and stir to combine. In the end fold in the chopped raisins and walnuts. Using your fingers, press the oatmeal raisin cookie dough on the bottom of the prepared baking pan and bake in preheated oven for 15 minutes. In the meantime, make the cheesecake filling. In a clean mixing bowl add the cream cheese and condensed milk and stir to combine. Add the eggs, vanilla extract and mix until smooth and creamy. Fold in the flour and stir to combine. Take the oatmeal raisin cookie crust out of the oven, without turning the oven off. Pour the cheesecake filling over the half baked oatmeal crust. To make the crumble topping, combine the oats, raisins, cinnamon chips and walnut pieces and sprinkle over the cheesecake layer. Bake for an additional 50 to 60 minutes or until the cheesecake is set. Leave to cool completely at room temperature before cutting in into 16 small squares. Congrats! That is awesome. I have an UBER lover for cheesecake. I also love cinnamon raisin cookies! So this is obviously a must try for me! Yay, congrats on winning the contest! 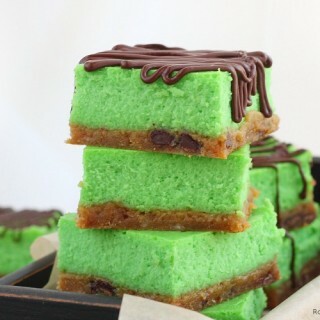 Love these bars, cheesecake bites sound just perfect to me! Congrats - so excited that you won!! 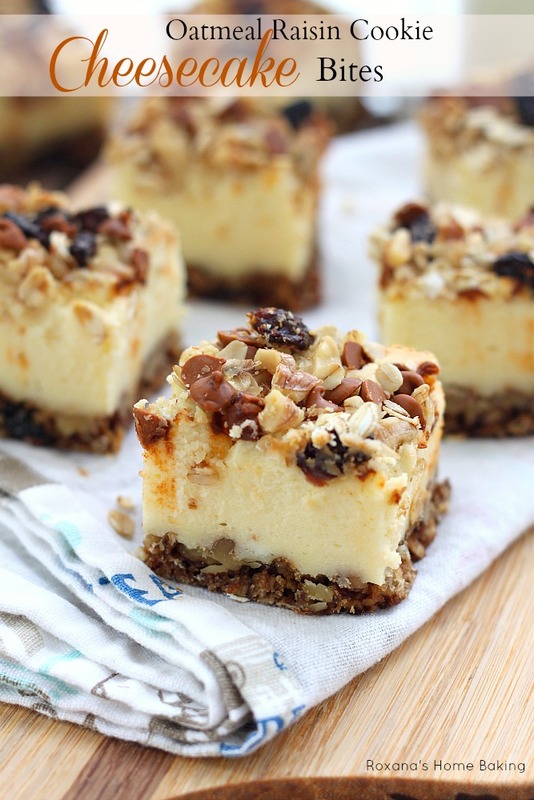 These cheesecake bites look incredible! 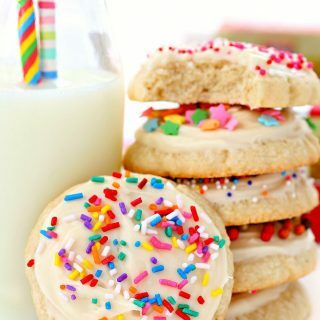 These look so incredible!!! What a great idea! What an awesome, inspired recipe! 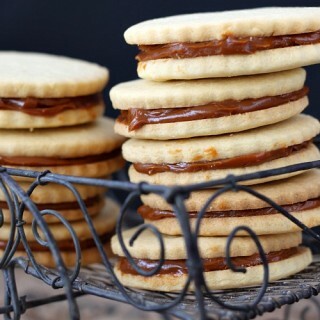 These little bites look HUGELY tempting! Okay first--- yay for you!!! That is So So So great! Keep dancing about winning that contest. Second-- I flipping love cheesecake AND oatmeal cookies AND raisins and you mixed them all together! I could hug you for this recipe right now. Honestly I'm not surprised at all that you won the contest! ;) CONGRATS!!! Totally well deserved especially with your amazing recipe. I'm about to make lunch for kids, but I rather want to keep looking at these... 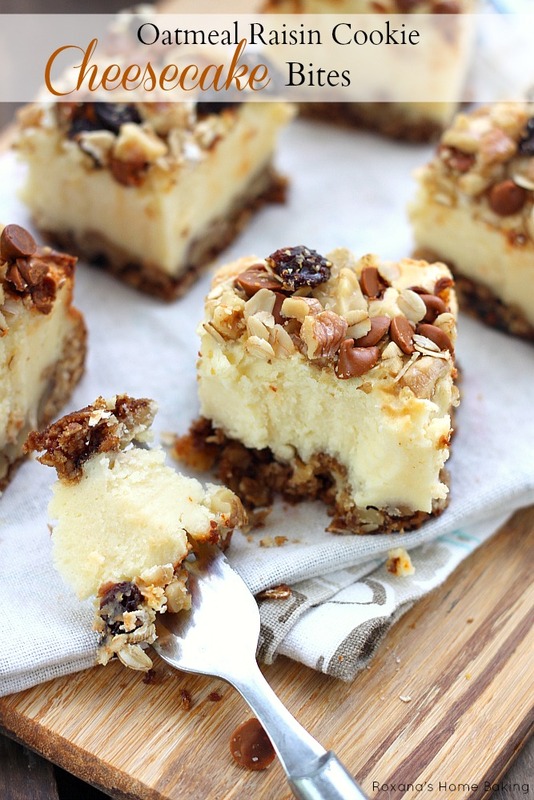 These cheesecake bites look amazing! 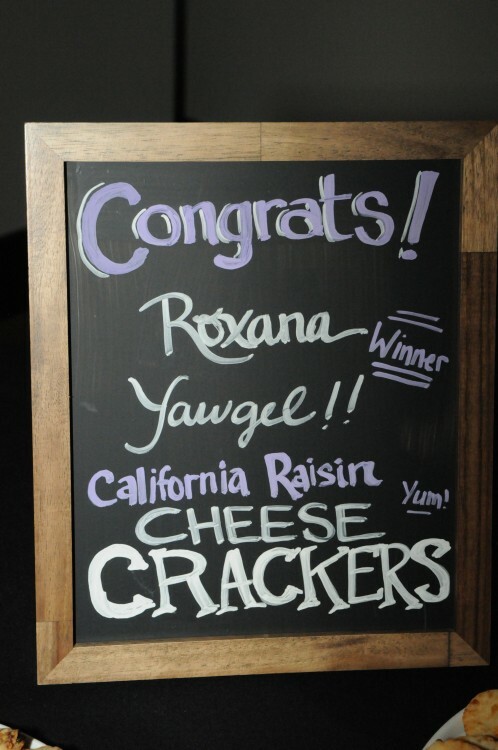 Congrats again on your win Roxana! You're a star! Love these bars, they look amazing! Oh my goodness these look absolutely incredible! 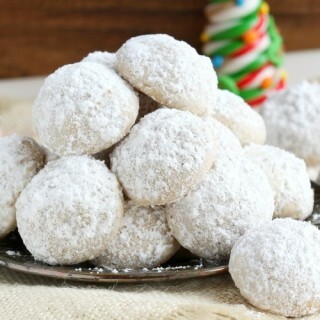 Congratulations Roxane, these bites make my mouth waters! Congratulations on winning 1st place in the baking contest, Roxy! Amazing job!! Holy moly these little guys look incredible! Yum! Congratulations on winning the contest! :) That's great! And these cheesecake bites look incredible. So creative and fun! Beautiful recipe. Thank you so much. Have a wonderful weekend!